Having an Ayurveda consultation and treatment was new for me , even though I’ve had many Ayurveda massages. Ayurvedic medicine is a traditional Indian system of health. Unlike Western allopathic medicine, Ayurveda is more concerned with health than sickness. 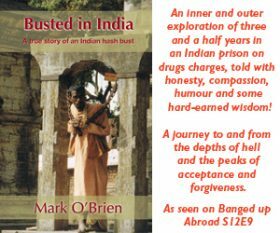 There is a 5,000 year history behind Ayurveda, and so lots of things have been tried, lots of data regarding the efficacy of various techniques has been gathered and lots of personalities have been treated. Definitely worth trying out. I was led into a room where the practitioner questioned me for some time about all kinds of facets of my life and health in much the same way as a naturopath, with a strong emphasis on bodily functions! After a fairly exhaustive interview it was decided what kind of treatment/massage I should receive, including the type of oil to be used. I was to be massaged by four people at once, which is a new one for me. I climbed up onto one of the special Ayurvedic tables with drainage facility (for some treatments, like Shirodhara, lots of oil is used) and let the fun begin! I have had multiple hands-on sessions before, and have found it confusing and a little overwhelming as there is some urge to stay in control, to know what each hand is doing. It immediately became apparent that I would just have to forget about watching anything and just have to let go. It was kind of strange at first having 8 hands on my body at once, but I really liked it. The massage went for 30 minutes or so, which was actually plenty. Then it was over and the practitioner told me some more things about my body she had felt and what I could do, particularly in terms of my diet. I was given some Tryphila which I was warned tastes really bad but does wonders! I found the whole Ayurveda thing to be very wholistic and integrated. The session room is kept quite dark, very soothing to walk into, and the session began with a head, neck and shoulder massage done sitting, and this I enjoyed after I got over the initial discomfort I experience when someone first starts massaging my head, which generally lasts as long as it takes me to fully arrive and relax. The practitioner told me that a lot of this was to stimulate the pituitary and pineal glands, and I relaxed more and more so that when after 20 minutes or so I got up onto the table I was very relaxed. The therapy table is unusual, being very large and plastic, shaped so that any oil runs off to the side to where it drains into a pot that gets poured onto your forehead again. Shirodhara entails having warm (around 35 – 40˚) oil pored continuously via a copper pot onto the forehead, the 3rd eye area. The therapist creates mixtures specific for the individual, in my case a mixture of black sesame, coconut and neem oils (all organic), which combination is good for cooling the system. This went for about 40 minutes, with the oil being recycled and reheated, the therapist gently massaging my scalp and moving the pot to vary where it was pouring onto. It was super relaxing, and though the therapist thought I fell asleep I was so “gone”, my experience was of sinking deeper and deeper into total relaxation. After some time the forehead goes a little numb, but I was aware of some explosions in my third eye, like orgasms in my brain which were totally delicious, maybe even illegal they were so nice! 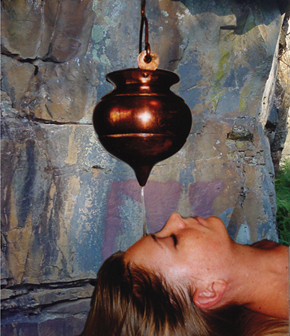 Shirodhara is used for reducing stress and expanding consciousness. By calming the mind the whole physiology relaxes, and this was my experience. Stimulating the pituitary gland brings hormonal balance. Because the oil was imbibed with “essence of me” it can’t be used by anyone else, so I was given the oil to take home with me, around 2 litres, for massage, bath, whatever. A great tonic, and a wonderful taste of how exotic Ayurveda can be.